Cool off with this alkaline alternative to coffee or caffeinated teas. Directions: Fill a large glass about halfway with Chanson ionized water straight from the ionizer and add the tea bag to steep. (Because ionized alkaline water is super hydrating, it will penetrate the tea bag without being heated.) Once steeped, remove tea bag and fill up most of the rest of the way with unsweetened coconut or almond milk. Add stevia, ice, stir and enjoy! Directions: Soak all produce in 8.0-8.5 pH Chanson alkaline ionized water for 10 min. Slice zucchini lengthwise into six strips. Sweat zucchini by sprinking sea salt on both sides and placing over a glass dish on top of a wire rack for one hour. Remove excess salt and water with paper towels, then chop zucchini. Combine salad ingredients in an 8 1/2″ X 11″ glass baking dish. Combine dressing ingredients in a food processor and process. Pour dressing over salad and allow to marinate in the refrigerator for at least 30 minutes before draining excess oil and serving. The American Heart Association recommends that women limit their sugar intake to 6 teaspoons a day and men are allowed 9 teaspoons. But in reality we are consuming an average of 22 teaspoons a day, and just one soda exceeds the daily limit at over 9 teaspoons. With excess sugar leading to a myriad of diseases and conditions like diabetes, cancer, heart disease, weight gain, premature aging and candida, its important that we try to limit our sugar intake as much as possible. Artificial sweeteners are not a solution as they often contain dangerous toxins that should be avoided. So what is one to do when one of those pesky sugar cravings strike? 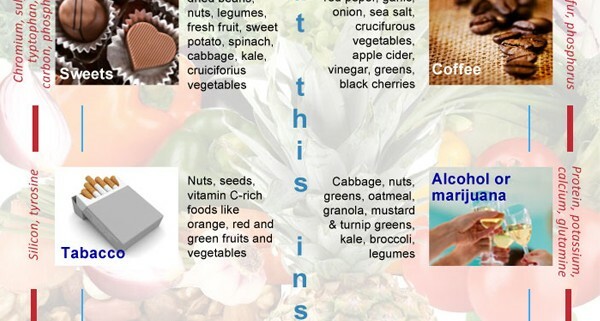 Studies show that when humans crave sweets, what we really need is chromium, sulfur, carbon, phosphorus, and tryptophan. Healthy foods like broccoli, grapes, dried beans, nuts, legumes, fresh fruit, sweet potato, spinach, kale, cabbage, and calciferous vegetables contain those elements and should be snacked on when sugar cravings strike. Ionized alkaline water from an electric water ionizer contains an electric charge which creates a craving to drink more water. Additionally, prolonged use of ionized alkaline water can cause sweets to become too sweet for your taste, making them less appealing. Ionized alkaline water is also very detoxifying to the body and may help flush out Candida. By replacing one sugary beverage like soda for a glass of water, you will take in about 45 less grams of sugar. Stevia is an all-natural sweetener with a low glycemic index that is available in both powdered and liquid form. It actually offers some health benefits and is sweeter than sugar so a little can go a long way. It is a great alternative to white and brown sugar and artificial sweeteners. As with any diet, clearing the pantry of the unhealthy foods you are trying to avoid will reduce your chances of overindulging on sweets. Start reading labels and stop buying the sweets you know you shouldn’t be eating. 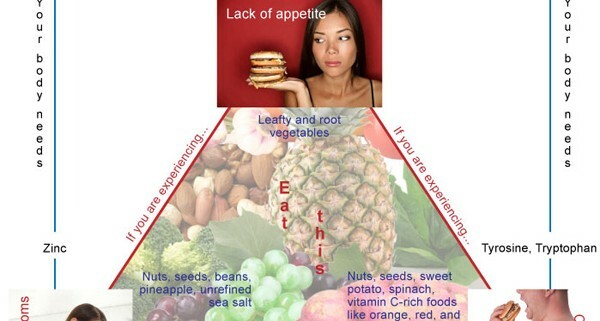 Even non-sugary junk foods should be avoided as they can be addicting. Stress creates cortisol, which increases blood sugar levels and creates sugar cravings. Meditation can help keep sugar cravings at bay by reducing stress, and eating small frequent meals will keep blood sugar stable. Also, when your serotonin levels are stable, you are less likely to have cravings for sweets, so try boosting your serotonin levels with a low glycemic diet, daily exercise and plenty of sleep. Chanson Water USA believes that a plant-based alkaline diet supplemented with ionized alkaline water from a water ionizer is the key to natural health and wellness. Grab your free copy of their new Alkaline Recipes Ebook and visit www.chansonwater.com for more information. A fresh and delicious alternative to preservative-packed store-bought salsas. Directions: Soak all produce in 8.0-8.5 pH Chanson alkaline ionized water for 10 minutes. 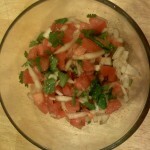 Combine all ingredients in a small bowl, stir and serve. Here’s an alkaline twist on a traditional Mexican drink. Instead of white rice, regular water, cow’s milk and white sugar, we have substituted alkaline ingredients for better nutrition in a version that’s just as delicious. Directions: Pour the rice and water into a blender and blend until the rice just begins to break up, about 1 minute. Let rice and water sit at room temperature for three hours minimum. Strain the rice water into a pitcher and discard the rice. Stir remaining ingredients (with the exception of the ice) into the rice water. Chill and stir before serving over crushed ice. Look for new alkaline recipes every Monday, check out our previous recipes, and visit us at www.chansonwater.com for more information about the health benefits of Chanson ionized alkaline water. 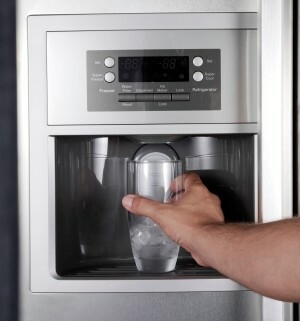 Many modern refrigerators now feature built-in water and ice dispensers. While they can be very convenient, these dispensers also pose some health hazards that you should be aware of. Although the water and ice being dispensed from these types of refrigerators is usually filtered, the water is most often filtered using nothing but a basic carbon filter. These filters are designed to remove a limited amount of pollutants such as chlorine from your water in order to make it taste better, much like a Brita pitcher. This leaves you vulnerable to an untold amount of chemicals and contaminants that have been found in tap water supplies including bacteria, sulfur, pesticides, nitrates, fluoride, arsenic, pharmaceutical drugs, and herbicides. Manufacturer directions indicate that the average refrigerator water filter needs to be changed every three to six months and the unit cleaned periodically, a task users often neglect. When was the last time you changed yours? Do you even know how? A clogged filter will decrease the efficiency of the system and may cause costly damage to the unit, as well as leach contaminant particles into your water and ice making it unhealthy to consume. And if you are one of the 70% of Americans who are living in a hard water area, you may need to change your filter even more often than recommended. Expired water filters and as well as filters which go unused for weeks are a breeding ground for mold, and contaminants can literally rot inside the filter. Ingestion of water which has been run through a moldy filter can cause headaches, runny nose, sinus problems, skin rash, diarrhea and vomiting. A healthier alternative to drinking from a refrigerator with built-in water dispenser is drinking from the tap when hooked up to a Chanson water pre-filter and water ionizer. The pre-filter removes contaminants while keeping healthy alkaline minerals in, and then ionizes those minerals to make them bioavailable to the body and turn the water alkaline. This results in a much healthier water which is still much more affordable than bottled water in the long run. Yes you will still have to to stick to a filter schedule and perform periodic maintenance as with any water filter, but the result will be well worth it. If you still wish to continue using your refrigerators built-in water and ice dispenser despite the warnings above, we recommend snapping Ionizer Armor onto the water line, as it will cause the water and ice to be smoother and softer. Find the best drinking water pre-filter and water ionizer for your household today or visit www.chansonwater.com for more information. 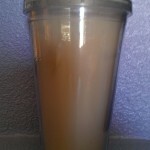 This refreshing beverage will keep you and your family cool and alkaline this summer. Directions: Soak all produce in 8.0-8.5 pH Chanson ionized alkaline water for 10 minutes. Juice produce directly into blender. Add ice, blend, and serve.